Christmas is coming up!! Call me crazy but I have been listening to Christmas music and watching Hallmark Channel as much as possible. It is my favorite time of year! I love shopping for Christmas presents and finding things I know the people in my life will love. But us law students... we are a special breed and our wants and needs can be different from most. 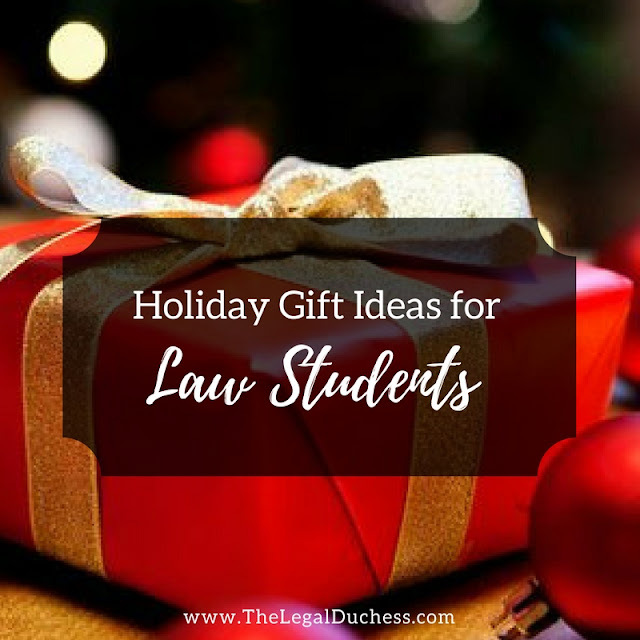 For all those family and friends out there who want to be supportive and help out your law student, here are some gift ideas that will be helpful and appreciated as they finish their legal education! These are so wonderful for law school!! I can listen to my music or recorded lectures, with no strings attached!! In loud and busy law school areas, these will be a law students best friend- particularly around exams! Law students tend to go overboard with caffeine so a coffee/tea mug is never a bad idea. I think this one is perfect for any aspiring lawyer ... Trust me (I am almost a lawyer). Every aspiring lawyer needs a professional bag for interviews and internships. This would be a super useful gift that will serve your law student very well through law school and beyond! Law students are notoriously broke and stressed. Gift cards to take themselves out to dinner, for a relaxing shopping trip or most importantly, for coffee. If all else fails, you truly cannot go wrong with some gift cards to let the law student in your life treat themselves. Also, gift cards to help law students build their legal wardrobes are a great idea. Express, Banana Republic, J. Crew are all great options for them to purchase professional wardrobe staples. Law school is super stressful... items to help your law student get some stress relief are always a good idea. Bath bombs, oil diffusers, a yoga mat, candles... etc. Your law student is probably always looking for inspiration... cute desktop signs or things to hang on the wall of their office to keep the motivation up in the heat of finals is a great gift idea. Remember when I said caffeine is very important to law students?? Well, this is extremely true and travel mugs are a lifesaver in the morning when you are running out the door for class. I LOVE the Contigo no spill mugs. Long days of class also call for lots of h2o. I have two favorites for this: Camelbak water bottles and my RITC tumblr (keeps ice cold for a full school day!). Your law student would certainly get lots of use from either of these. Amazon prime is the greatest thing. Not only do you get access to Prime movies and TV shows and the Amazon music library, there is free two-day shipping on almost everything! For busy law students, that is the best way to shop. Your law student would be so appreciative of an Amazon Prime membership and for students, it is half price! This is the gift that keeps on giving all year long. Great ideas all, Legal Duchess, thank you. Given that you mention you are listening to Christmas music, could there be a more appropriate law student gift than our LawTunes original lawyer holiday humor music albums: “The Lawyer's Holiday Humor Album,” “Legal Holidaze,” “Merry Lexmas From The LawTunes,” “The LawTunes: Live At Blackacre” (an imaginary concert at an imaginary place that exists only in law school exams and scholarly legal articles), “Season's Briefings From The LawTunes,” and “Yule Hear From Our Lawyers.” Among the most popular songs are “All I Want For Christmas Is A Stomach Lining,” “You Don’t Wanna Cross Santa,” “I Got A Footnote In My Stocking,” “Rainmaker Reindeer,” and “It’s Gonna Be A Billable Christmas.” The tongue-in-cheek tunes cover the gamut from bar exams, ridiculous hours/all-nighters and the other sacrifices lawyers (and their families) make, client relations, the adversarial system, negotiating, time records and legal bills, impossible deadlines, legal reasoning and argument, cross-examination, business travel, lawyer marketing/business development, headhunters and lateral movement, continuing legal education, mountainous document review and production, and onerous legal citation style. Thanks again and Happy Holidays! I would definitely recommend to represent you because he not only cares about his clients, but his way in the court room is nothing you have seen before. He has great thinking skills! He is a really good attorney and I am glad he was able to represent me. My trial ended very well and I can’t express enough how thankful quick guide.